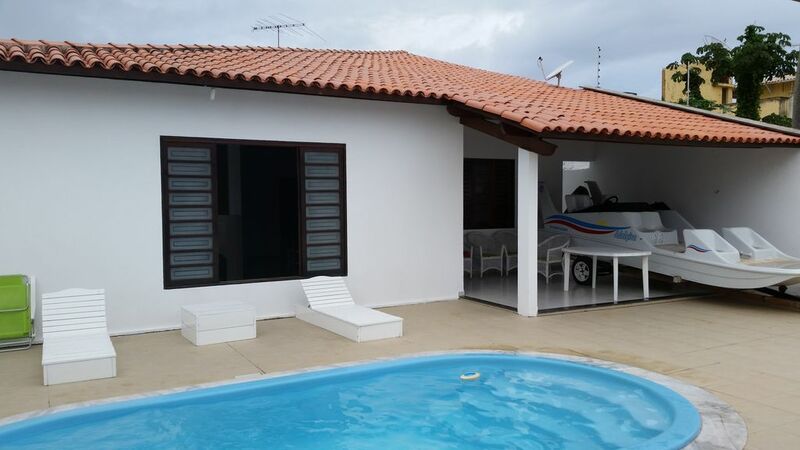 House located town of Barra de São Miguel with 03 bedrooms, 04 bathrooms, living room and dining room, kitchen, laundry room, recreation area with pool, barbecue and bathroom in the outer area, well ventilated, lit and cozy. Accommodates 9 people in beds, with space to accommodate 15 people with mattress on the floor. It features all minimum necessary utensils such as stove, refrigerator and television. In the daily is included cleaning the pool. You can get around to the beach on foot. The city of São Miguel Toolbar whole church structure, banks, supermarkets, bakeries, pharmacies, restaurant, in short everything for your stay. 4 bathrooms, one en suite, social, reversible for two rooms and recreation area. Casa muito ótima com bastante espaço e área de lazer com piscina. House very well located, close to the town pier where tours are conducted to Gunga beach. It can be known tourist cities such as Marechal Deodoro, French Beach and Marape Dunes which has the proximity of 10 km, with easy shifting and road in perfect condition. Before Maceio, we have a great gastronomic center, known as Massagueira with bars and restaurants on the edge of Mundaú lagoon.